A plaque just east of Woodranch Road on Camino Tassajara marks the location of Sycamore School, one the valley’s six early grammar schools. Built in 1866, the school served students for more than 60 years. Several teachers taught there, but the school is especially remembered for its pioneer teacher, Charlotte E. Wood. 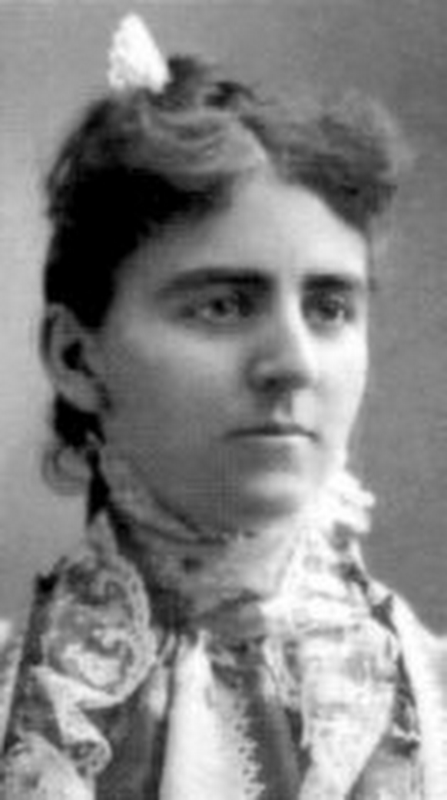 She was a Sycamore School student from 1869 to 1877 and then taught at the school for 31 years, from 1890-1921. Miss Wood wrote several accounts of Sycamore. Her history of school life appeared in the Valley Pioneer Centennial Edition on Sept. 4, 1958: “In its early days the Sycamore School was a public center for important events—social activities, picnics, parties, school ‘exhibitions,’ etc. 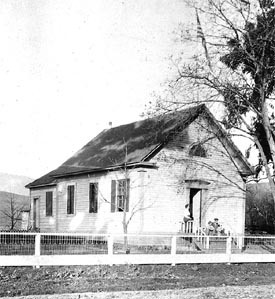 A literary society, Sunday school and church services conducted at various times and occasionally a Christmas tree celebration were held in this pleasant gathering place”. On arriving at the school house, occasionally a woodpecker, blue-jay or hammer would be heard scrambling about in the long stovepipe, or per chance one had pecked his way through the wooden wall of the building (a quite frequent occurrence requiring many a piece of tin to stop the unsightly holes). “Then ensued a wild scramble among the boys to capture the intruders, which were placed in a glass covered box to be used as fine object lessons on bird life, for composition, drawing or oral study. These apparently trivial episodes really were of great value, encouraging a keen interest in nature and providing topics familiar to the children, yet in no way hampering their indoor work. “The volume of the voice allayed any fear of fatal injury, but I rushed to the rescue just in time to see his older brother grab the small boy in his arms and run to the pump (the school’s water supply) where a deluge of spurts cooled not only the injured brow but the ardent temper of the little fellow. “Quite like a small family were we with our walks along the pretty creek, seeking material for compositions or drawing work; studying flowers, nests, curios; and picking under the spreading branches of a magnificent oak while playing guessing games. The library, from its two volumes in 1866, grew to number 950 or more in 1920.“A movie camera would have had some interesting and amusing subjects to photograph as the school cavalcade started home at the close of each day. Several crowded carts, well laden horses and even ‘Judy’ the tiny burro, sometimes carrying three or four little riders. After a new elementary school opened in Danville, the Sycamore School closed in 1927 and students went to the modern four-room school. The old building became the residence of Joe Mitchell’s family and burned down in 1945. Charlotte Wood’s words about her years there help keep the memory of her beloved school alive. Source: Valley Pioneer, 1958; Contra Costa Gazette, 1867. This picture of the Sycamore School probably shows Charlotte Wood and her two nephews Howard and George Wood. One of the children is holding a dog, and a cat lurks in the background.